A hand-coloured print of Spence's Hotel, Calcutta, from the Fiebig Collection: Views of Calcutta and Surrounding Districts, taken by Frederick Fiebig in 1851. This is a view looking south along Clive Street, with Spence's Hotel on the right and the grounds of Government House on the left. Spence's Hotel was one of the first hotels in Calcutta, opened by 1830. It was necessitated due to the large numbers of visitors coming to Calcutta from Britain and other parts of India. 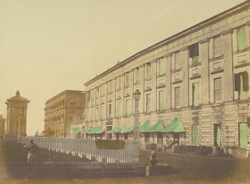 As the Government encroached on buildings around Government House, Spence's Hotel was moved to another location before eventually being demolished.